Majority of the insurers cite lack of IT resources as their biggest challenge in implementing anti-fraud technology. 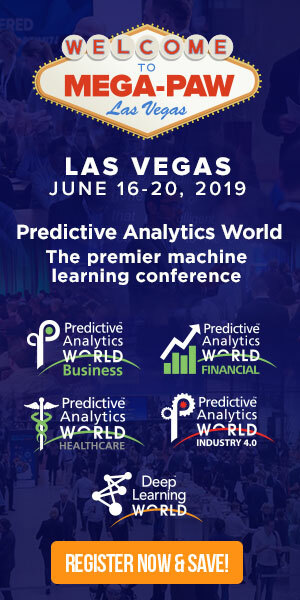 Predictive Analytics World for Business, March 29 – April 2, 2015 in San Francisco, will include five (5) sessions on insurance application from industry leaders. LAS VEGAS — The use of anti-fraud technology by insurers in North America is on the rise. However, many companies are still struggling with the deployment of proactive predictive analytics tools because of resource constraints, according to a study. Nearly 95 per cent of insurance companies reported using anti-fraud software as of 2013. That’s a marked increase from just 88 per cent the previous year, according to a study conducted by the Coalition Against Insurance Fraud with the help of big data analytics software maker SAS Institute. The CAIF, is a Washington, D.C.-based alliance of insurance companies, government agencies and consumer groups that have banded together in 1993 to battle insurance fraud through legislative advocacy and consumer education. The organization’s latest survey — released here as part of SAS’ Leadership conference — also found that insurance companies tend to focus the use of technology against claims-based fraud and only less than half of the businesses are using technology to combat underwriting and internal fraud, which the CAIF said are emerging concerns in the industry. Majority of the insurers (53 per cent) cited lack of IT resources as their biggest challenge in implementing anti-fraud technology. The CAIF study is a follow-up to a 2012 survey conducted by the organization to understand how the industry is deploying technology to tackle insurance crimes. The study involved a qualitative research including a series of in-depth interviews with experts and senior insurance executives as well as an online survey of 42 insurers, which CAIF said represented a significant share of the property and casualty insurance market. Another rising source of fraud is point-of-sale or underwriting where fraudsters conspire to reduce insurance premiums. The number of insurance companies reporting cyber-attacks meant to steal large amounts of customer personal information has risen significantly since 2012, the CAIF report said. Yet, only 14 per cent of companies employ technology to prevent cyber-attacks. The traditional and “first line of defence” that most insurance companies deploy is automated red flags/business rules systems, according to the study. A total of 81 per cent of respondents reported using such technologies. The advantage of business rules-based systems is simplicity. “Unfortunately, however, business rules often generate high false-positive rates and undetected fraud because fraudsters can easily learn and manipulate such rules,” CAIF said. Seventeen per cent of respondents cited excessive false-positives/negatives as the biggest challenges to implementing an anti-fraud solution. Lack of IT resources also forces many companies to lean on already-overworked IT departments. Data integration and poor data quality (14 per cent), lack of return of investment (eight per cent), inability of special investigation units to handle volume of potential fraudulent claims (six per cent) and delayed adjudication (three per cent) were other challenges cited. Interestingly, in the 2012 survey, the percentage of respondents that cited ROI as a challenge was 36 per cent. The study said employing the “right mix of tool and technologies” will result in a higher fraud-detection rate. Pingback: Analytical Worlds Blog – Predictive Analytics and Text Analytics – by Eric Siegel, Ph.D.How Predictive Analytics Reinvents These Six Industries - Analytical Worlds Blog - Predictive Analytics and Text Analytics - by Eric Siegel, Ph.D.